Dec. 24 (Bloomberg) -- Oil traded little changed after a government report yesterday showed a larger-than-expected decline in U.S. stockpiles, signaling a recovery in fuel demand in the world’s largest energy consumer. U.S. crude inventories fell for a third straight week, dropping to the lowest level since January, according to yesterday’s report. Crude oil for February delivery fell 17 cents, or 0.2 percent, to $76.50 a barrel in electronic trading on the New York Mercantile Exchange as of 1:27 p.m. London time. It earlier traded as high as $77.48 a barrel, the highest intraday price since Dec. 4. There will be no trading tomorrow on Christmas Day, or on Jan. 1 for New Year’s Day. Pumping has restarted through Iraq’s 450,000 barrel-a-day oil export pipeline to Turkey after an explosion forced its closure on Dec. 20, Turkey’s Energy Ministry said. Volume through the link should return to normal in a few days, a ministry official in Ankara said today, speaking on condition of anonymity. U.S. crude stockpiles had the biggest one-week decline since September as supplies fell 4.84 million barrels to 327.5 million, more than the 1.6 million barrels forecast in a Bloomberg survey before the report. Oil has gained 73 percent this year, poised for its biggest yearly gain in a decade. Brent crude oil for February settlement fell 35 cents, or 0.5 percent, to $75.10 at 1:26 p.m. on the London-based ICE Futures Europe exchange. Yesterday, it rose $1.99 to end the session at $75.45 a barrel, the highest close since Dec. 7. Dec. 24 (Bloomberg) -- Gold rose the most in a week as a drop in the dollar spurred demand for precious metals as alternative assets. Silver, platinum and palladium also gained. The dollar fell to the lowest level this week against a basket of six major currencies, losing as much as 0.5 percent. Bullion, which some traders buy as a hedge against inflation, typically rises when the dollar falls. The metal has gained 25 percent this year, touching a record $1,227.50 an ounce earlier this month, as the dollar slipped more than 4 percent. “Sentiment remains firm this morning as the greenback remains under pressure,” James Moore, an analyst at TheBullionDesk.com in London, said in a report. Gold futures for February delivery gained $10.80, or 1 percent, to $1,104.80 an ounce on the New York Mercantile Exchange’s Comex unit, the biggest advance since Dec. 16. The metal has rallied this year as U.S. growth slumped during the longest recession since World War II, spurring demand for an investment haven. Gold held by the SPDR Gold Trust, the biggest exchange-traded fund backed by bullion, was unchanged for a second day at 1,132.71 metric tons as of yesterday, according to the company’s Web site. Signs of improving U.S. growth sparked a rally in the dollar this month, after the currency fell to a 15-month low in November. Before today, gold slid 7.5 percent in December as the U.S. Dollar Index, the six-currency basket, rose 4 percent. Investors should avoid building new positions in a market thinned out by year-end holidays, said Jon Nadler, a Kitco Inc. senior analyst in Montreal. In London, gold for immediate delivery climbed $17.68, or 1.6 percent, to $1,105.23 an ounce at 6:40 p.m. local time. In New York, silver futures for March delivery rose 25 cents, or 1.5 percent, to $17.44 an ounce on the Comex. Platinum for April delivery gained 2.9 percent, the most in five weeks, to $1,474 an ounce on the Nymex, and palladium for March delivery surged 9 percent, the most in 13 months, to $389.65 an ounce. Dec. 22 (Bloomberg) -- The Organization of Petroleum Exporting Countries agreed to keep production targets unchanged for a fourth time this year, as expected. The producer group kept total output quotas at 24.845 million barrels a day, Saudi Arabia’s Ali al-Naimi and other ministers said after their meeting today in Luanda, Angola. OPEC is content with today’s oil price near $73 a barrel even as most of its members pump more than their allotted targets. “Going forward, OPEC has to get a bit more serious at either improving compliance or really holding the line and stopping this upward creep in production,” said Mike Wittner, head of oil research at Societe Generale SA in London. Oil prices fell following the decision. Crude for February delivery fell as much as $1, or 1.4 percent, to $72.72 a barrel on the New York Mercantile Exchange and traded at $72.87 at 4:12 p.m. London time. Ministers from OPEC’s 12 member nations said there was a consensus to keep quotas unchanged even before they met for the closed-door talks, which lasted about 70 minutes. “That really cements $70 a barrel as the floor for prices,” said Amrita Sen, a London-based oil analyst at Barclays Capital. OPEC last reduced its production targets in late 2008 in response to falling oil prices and demand following the worldwide recession. Quotas allowing combined output of 24.845 barrels of crude a day took effect at the beginning of 2009. Global oil output is about 86 million barrels a day, according to the International Energy Agency. “OPEC’s strategy is if you combine recovering demand with flat OPEC production, you are going to get stock draws,” SocGen’s Wittner said. The 11 members bound by quotas pumped 1.66 million barrels a day more than the collective ceiling in November, according to Bloomberg estimates, meaning those countries have completed 61 percent of their pledged 4.2 million barrel-a-day cut. Iraq is not bound by production quotas. Abdalla el-Badri, the OPEC secretary-general, said he wants quota compliance to improve to between 75 percent and 80 percent. While OPEC’s end-of-meeting communique today spoke of member countries repeating “their commitment to the individually agreed production allocations,” the reality is that most members are flouting agreed targets to take advantage of higher prices. As well as excess production from Iran and Venezuela, Nigerian output has also swelled in recent months following a cease-fire by militants in the Niger Delta, Bloomberg estimates show. Angolan Oil Minister Jose Maria Botelho de Vasconcelos acknowledged his country is not complying with “expected” levels with respect to its OPEC production quota. “We are complying at certain levels but our production capacity is significantly higher than the quota that was given to us,” the minister said at a press conference in Luanda. Iraq may also become a headache for the producer group in future years because it is exempt from quotas and has signed several contracts with international companies such as BP Plc and Royal Dutch Shell Plc to boost oilfield production. A presentation by the OPEC Secretariat, shown today to OPEC ministers and journalists, said the economic crisis had resulted in some permanent loss in oil demand from developed nations in the Organization for Economic Cooperation and Development. The IEA on Dec. 11 raised its forecast for oil demand next year, highlighting growth in Asia and the Middle East, rather than the OECD. “A key risk to the forecast pertains to the U.S. outlook,” the Paris-based agency said in its monthly report. Oil prices have risen 63 percent this year, rewarding oil companies such as Exxon Mobil Corp. and OPEC nations that will earn about $575 billion in 2009 from oil exports, while hurting an airline industry that the International Air Transport Association forecast will lose $5.6 billion next year. OPEC’s 12 members are Algeria, Angola, Ecuador, Iran, Iraq, Kuwait, Libya, Nigeria, Qatar, Saudi Arabia, the United Arab Emirates and Venezuela. The group’s next meeting is scheduled for March 17 in Vienna. Dec. 24 (Bloomberg) -- Oil traded above $76 a barrel in New York, after gaining the most in a month on a report showing a larger-than-expected decline in U.S. stockpiles. Oil rose 3.1 percent yesterday after the Department of Energy said supplies had their biggest drop since September. Confidence among U.S. consumers increased in December for the first time in three months as the pace of job cuts slowed. Crude oil for February delivery traded at $76.68, up 0.1 percent, in electronic trading on the New York Mercantile Exchange at 11:42 a.m. Sydney time. Oil increased $2.27 to $76.67 yesterday, the highest settlement since Dec. 1 and the biggest gain since Nov. 16. Prices are up 72 percent this year. Oil may reach $90 in 2010, driven by Chinese demand, Nick Raffan, an analyst at Fat Prophets, said in an interview today in Sydney. “China’s growth rates are startling,” he said. Futures have traded between $68.59 and $82 since Oct. 6. Supplies fell 4.84 million barrels to 327.5 million last week, the report showed. Inventories were forecast to decrease by 1.6 million barrels, according to a Bloomberg News survey. Stockpiles of gasoline and distillate fuel, a category that includes heating oil and diesel, dropped as demand climbed. The Reuters/University of Michigan final index of consumer sentiment rose to 72.5 from 67.4 in November. The figure was lower than the preliminary 73.4 reading, reported on Dec. 11. Imports of crude to the U.S. fell 0.8 percent to 7.71 million barrels a day, the lowest since September 2008 when ports were shut because of hurricanes Gustav and Ike. Fuel imports slipped 8 percent to 2.42 million barrels a day, the lowest since October. Inventories of crude oil last week were 5.3 percent higher than the five-year average for the period, the department said. Supplies of gasoline and distillate fuel were also above average. Refineries operated at 80 percent of capacity last week, little changed from the prior week. Analysts surveyed by Bloomberg News forecast a 0.4 percentage-point gain. Gasoline stockpiles fell 883,000 barrels to 216.3 million, the first decline in five weeks. A 1 million-barrel increase was forecast, according to the median of 16 analyst responses in the Bloomberg News survey. Distillate supplies tumbled 3.03 million barrels to 161.3 million, the biggest drop since April. Analysts forecast a 2 million-barrel decline. Traders expect reduced volumes during the final two weeks of the year as investors take holidays. There will be no trading tomorrow for Christmas and on Jan. 1 for New Year’s Day. Oil also advanced yesterday as the dollar dropped against the currencies of the U.S.’s biggest trading partners. A weaker dollar increases the appeal of commodities to investors. Brent crude oil for February settlement rose $1.99, or 2.7 percent, to end the session at $75.45 a barrel on the London- based ICE Futures Europe exchange yesterday. It was the highest close since Dec. 7. Dec. 24 (Bloomberg) -- The dollar may extend its decline from almost the strongest level since September on speculation that the Federal Reserve won’t seek an early exit from stimulus measures. The greenback may fall for a second day against the 16- nation euro after a report showed sales of new homes in the U.S. unexpectedly fell last month and before a report next week forecast to show a decline in business activity. The yen traded near the weakest level in eight weeks on prospects the Bank of Japan may prolong credit easing to fend off deflation. The dollar traded at $1.4336 per euro at 8:36 a.m. in Tokyo from $1.4337 yesterday in New York. It rose to $1.4218 on Dec. 22, the strongest level since Sept. 4. The dollar was at 91.64 yen from 91.64 yen yesterday. The greenback traded at intraday highs of 91.87 yen in the past two days, the strongest since Oct. 27. The euro was at 131.37 yen from 131.38 yen in New York. The dollar had rallied more than 5 percent this month versus the euro and traded within a quarter-cent of its 200-day moving average of $1.4198 before yesterday’s decline. The dollar is down 2.5 percent in 2009. Sales of new homes in the U.S. decreased 11 percent in November to an annual pace of 355,000 from a revised 400,000, the Commerce Department reported yesterday. The median estimate of 72 economists in a Bloomberg survey was for an increase to 438,000 from a previously reported 430,000. The Institute for Supply Management-Chicago Inc. will report on Dec. 30 its barometer of U.S. business activity fell to 55.1 in December from 56.1 in the previous month, according to a Bloomberg News survey of economists. Readings above 50 signal expansion. Futures trading in Chicago indicated a 48 percent chance that policy makers will increase the zero to 0.25 percent target rate for overnight lending between banks by at least a quarter- percentage point by the June meeting, down from a 52 percent likelihood a week ago. Central banks reduced purchases of U.S. dollars in the third quarter, possibly cutting them to a record low of less than 30 percent of new foreign-exchange reserves, Barclays Capital said in a note to clients. Global central banks probably bought $50 billion in the quarter, out of some $250 billion of reserves that were added in the period through transactions, Barclays said, citing calculations based on data from the International Monetary Fund and U.S. official reports. The U.S. currency has appreciated 5.7 percent versus the euro from this year’s weakest level of $1.5144 reached on Nov. 25. Before the Dec. 4 payrolls report showed an unexpected drop in the unemployment rate, the greenback had fallen 17 percent from the 2009 peak reached in March as investors bought higher- yielding assets with borrowed dollars. Orders for goods meant to last several years increased 0.5 percent in November, after falling 0.6 percent in the previous month, according to the median estimate of 72 economists in a Bloomberg survey. The Commerce Department report is due today. The yen may weaken again after snapping a six-day decline against the dollar yesterday, the longest losing streak since January 2007, on speculation that strong deflationary pressure will force the Bank of Japan to stand pat on rates. BOJ Governor Masaaki Shirakawa said this week the central bank will “persistently” keep interest rates at “virtually zero” to fight deflation. The central bank on Dec. 18 said it won’t tolerate a year-on-year rate of change in consumer prices “equal to or below zero percent,” while holding its key overnight rate at 0.1 percent. Consumer prices excluding fresh food fell 1.8 percent in November from a year earlier, according to the median estimate of economists in a Bloomberg News survey before the statistics bureau releases the data tomorrow in Tokyo. FKLI Dec Futures contract traded 6 point higher to close at 1263.5 levels as compare to previous trading session to with a total of 4,534 lots traded in the market. FKLI burst upwards after long consolidation for the past few trading days; fueled with strong regional equity indices especially ShangHai and Hang Seng Indices. FKLI seem traded below resistance trend line after attempt to break up at 1263.5 resistance levels in the hourly price chart. Technically, FKLI manage to rebound 78.6% Fibonacci levels at 1266.5 regions after support levels at 1256 well hold against the selling pressure. FKLI still seen uncertainty on direction as resistance levels 1269 and 1276 has yet to penetrate. However, FKLI still remain on bullish on medium term as long as support levels at 1256 and 1251.5 were not violated during trading sessions. CPO 3rd month Mac futures contract traded RM21 points lower as compare to previous trading sessions to close at RM2494 with a total of 6,089 lots traded in the market. CPO continue to trade lower during trading sessions as soybean oil was traded weak during overnight and electronic trading on Domino effect as both are edible oil. CPO price plunge lower after traded below the support trend line in the hourly price chart where previous support levels seen at RM2517 regions. Technically, CPO price plunge lower as previous support levels fail to hold against the selling pressure at RM2517 regions. However, selling pressure has been held effectively at RM2481; 23.6% Fibonacci support levels range from RM2012 to RM2628 regions. Failure to hold above RM2488 levels indicates CPO price likely traded in short term bearish zone where critical resistance levels seen at RM2555 and RM2600 regions while support levels remain seen at RM2481 and RM2319 regions. Dec. 23 (Bloomberg) -- Crude oil rose for a second day in New York as positive housing and fuel-inventory data signaled a recovery in the U.S., the world’s largest energy user. Oil climbed above $74 a barrel yesterday after the National Association of Realtors reported November sales of existing homes increased at the highest annual rate since February 2007, indicating the industry at the center of the recession has stabilized. Separately, the American Petroleum Institute said the country’s crude oil and refined-product stockpiles declined. Crude oil for February delivery rose as much as 38 cents, or 0.5 percent, to $74.78 a barrel in electronic trading on the New York Mercantile Exchange. The contract was at $74.75 at 4:06 p.m. Singapore time. Futures closed yesterday at $74.40, the highest settlement since Dec. 4. There will be no trading Dec. 25 for Christmas and on Jan. 1 for New Year’s Day. Oil, which lost 54 percent in 2008, has gained 68 percent this year on speculation global demand for fuels will increase with the economic rebound. Yesterday’s existing-homes sales figure rate exceeded the highest estimate from economists surveyed by Bloomberg News. The Commerce Department is expected to report today November sales of new homes also increased. Commercially held crude oil inventories in the U.S. fell 3.71 million barrels last week to 328.8 million, said the industry-funded American Petroleum Institute. Gasoline stockpiles declined 1.1 million barrels to 215.9 million, the biggest drop in 10 weeks. Distillate fuel supplies, which include heating oil and diesel, slipped 745,000 barrels to 165.1 million, the API said. An Energy Department report today is expected to show crude oil stockpiles fell 1.6 million barrels in the week ended Dec. 18, according to the median of estimates from 16 analysts polled by Bloomberg News. Distillate inventories probably dropped 2 million barrels, the survey showed. The report will be released at 10:30 a.m. in Washington. U.S. gasoline demand rose the most in three weeks as drivers in the northeast filled up before a snowstorm, according to MasterCard Inc., the second-biggest credit card company. Motorists bought an average 9.57 million barrels a day of gasoline in the week to Dec. 18, MasterCard said yesterday in its SpendingPulse report. Consumption increased 2.9 percent from the previous week and 1.7 percent from a year earlier. The Organization of Petroleum Exporting Countries agreed at a meeting yesterday in Luanda, Angola, to hold production quotas at 24.845 million barrels a day. The 12-member group, which pumps about 40 percent of the world’s oil, has gathered four times this year without revising official output targets. Rising oil prices have encouraged some OPEC members to renege on their pledge in 2008 to reduce supply by 4.2 million barrels a day. Secretary-General Abdalla el-Badri said he wants quota compliance to improve to between 75 percent and 80 percent from the current level of about 60 percent. Brent crude oil for February settlement rose as much as 46 cents, or 0.6 percent, to $73.92 a barrel on the London-based ICE Futures Europe exchange. The contract was at $73.90 at 4:07 p.m. Singapore time. Yesterday, it advanced 47 cents, or 0.6 percent, to settle at $73.46 a barrel. Dec. 23 (Bloomberg) -- Crude oil traded above $74 a barrel in New York after rising on signs that economies around the world are recovering. Oil advanced 0.9 percent yesterday as a U.S. report showed sales of existing homes in the world’s biggest energy-consuming country increased in November to the highest level in almost three years. The U.S. economy expanded 2.2 percent in the third quarter, compared with a 2.8 percent gain previously reported. Crude oil for February delivery was at $74.50, up 10 cents, in electronic trading on the New York Mercantile Exchange at 11:25 a.m. Sydney time. Oil, which rose 68 cents to $74.40 yesterday, is up 67 percent this year. Traders are expecting reduced volumes during the final two weeks of the year as investors take holidays. There will be no trading on Dec. 25 for Christmas and on Jan. 1 for New Year’s Day. Futures in New York have traded between $68.59 and $82 since Oct. 6. The U.S. currency traded at $1.4251 versus the euro early today, little changed from $1.4249 in New York yesterday, when it touched $1.4218, the highest since Sept. 4. U.S. existing home purchases increased 7.4 percent to a 6.54 million annual rate from a revised 6.09 million pace the prior month, the National Association of Realtors said yesterday in Washington. It was the highest level since February 2007. The U.K. economy shrank 0.2 percent, less than the 0.3 percent contraction initially reported by the government. The Organization of Petroleum Exporting Countries agreed at a meeting in Luanda, Angola, to hold quotas at 24.845 million barrels a day. OPEC ministers have met four times this year without revising production figures. Rising prices have encouraged some OPEC members to renege on their pledge in 2008 to reduce output by 4.2 million barrels a day. Members complied with 58 percent of cuts in November, down from 60 percent the previous month, according to International Energy Agency estimates. Abdalla el-Badri, the OPEC secretary general, said he wants quota compliance to improve to between 75 percent and 80 percent from the current level of about 60 percent. Brent crude oil for February settlement increased 47 cents, or 0.6 percent, to end the session yesterday at $73.46 a barrel on the London-based ICE Futures Europe exchange. A government report due today is forecast to show that U.S. supplies of crude oil fell 1.6 million barrels last week, according to the median of 16 responses by analysts in a Bloomberg News survey. Stockpiles of distillate fuel, a category that includes heating oil and diesel, also dropped, the analysts said. Gasoline inventories probably rose. The industry-funded American Petroleum Institute said crude oil inventories fell by 3.71 million barrels last week to 328.8 million. Supplies of gasoline declined by 1.1 million barrels to 215.9 million. Dec. 22 (Bloomberg) -- Gold prices fell to a seven-week low on speculation that an improving U.S. economy will help extend this month’s rally in the dollar and reduce demand for precious metals as an alternative investment. The U.S. grew at a 2.2 percent rate in the third quarter, the fastest pace in two years, the government said today. Gold has fallen 8.1 percent this month as signs of economic expansion spurred a 4.4 percent gain in the dollar against a basket of six currencies. The greenback is headed for its first monthly increase since June. “The trend is your friend, and the trend right now is for lower gold prices as the dollar gains,” said Leonard Kaplan, the president of Prospector Asset Management in Evanston, Illinois. Gold futures for February delivery fell $9.30, or 0.8 percent, to $1,086.70 an ounce on the New York Mercantile Exchange’s Comex unit. Earlier, the price dropped to $1,075.20, the lowest level for a most-active contract since Nov. 3. The U.S. Dollar Index, a six-currency basket that often moves in the opposite direction of gold, rose as much as 0.5 percent and has rallied for three straight weeks. “There’s not a huge move in the dollar today, but it doesn’t take away from the fact that the overall trend is lower” for gold prices, Kaplan said. Bullion has gained 23 percent this year as the longest recession since World War II eroded the dollar and boosted demand for gold as a haven. The metal yesterday settled more than 10 percent below its record closing price of $1,218.30 an ounce, a slump that some analysts consider a correction. “One can never underestimate the power of the urge to square up, to take one’s trading lumps and to reduce collective exposure,” Dennis Gartman, a Suffolk, Virgina-based economist and hedge-fund manager, told clients in his Gartman Letter today. Investors should “stay long gold” in the first half of next year on concern that the pace of U.S. inflation will accelerate and because jewelry demand will recover, Andrey Kryuchenkov, a VTB Capital analyst in London, said today in a report. The metal will average $1,100 to $1,150 next year, he said. Gold for immediate delivery in London fell 0.5 percent to $1,087.80 an ounce at 7:09 p.m. local time. Silver for March delivery was little changed, falling 0.5 cent to $17.03 an ounce on the Comex in New York. Platinum for April delivery declined 1.8 percent to $1,402.90 an ounce on the Nymex, and palladium for March delivery slipped 3.1 percent to $354.25 an ounce. Dec. 23 (Bloomberg) -- The dollar traded near the highest in more than three months versus the euro before a report forecast to show new home sales rose in the U.S., adding to signs of recovery in the world’s largest economy. The dollar was near an eight-week high against the yen as the yield on U.S. 10-year notes rose, boosting the advantage of holding Treasuries instead of Japanese debt to the widest margin in more than a year. New Zealand’s dollar fell after a government report showed the economy expanded 0.2 percent in the third quarter, half the pace forecast by economists. The dollar traded at $1.4256 versus the euro as of 9:19 a.m. in Tokyo from $1.4249 in New York yesterday, when it touched $1.4218, the highest since Sept. 4. The dollar fetched 91.79 yen from 91.83 yen. It earlier reached 91.87 yen, the strongest since Oct. 27. The yen was unchanged at 130.86 per euro. Japan’s markets are closed today for a public holiday. The Dollar Index, which IntercontinentalExchange Inc. uses to track the greenback against currencies including the euro and yen, rose yesterday to as high as 78.449, the most since Sept. 4. The difference between 10-year Treasury yields and the same maturity Japanese government bonds widened to 2.49 percentage points yesterday, the highest level since October 2008. Sales of new homes in the U.S. probably rose to a 438,000 annual pace in November from 430,000 in October, according to the median estimate of economists in a Bloomberg News survey. The Commerce Department will release the data today. Purchases of U.S. existing homes increased 7.4 percent in November to a 6.54 million annual rate, the highest since February 2007, the National Association of Realtors said yesterday. The median estimate of 69 economists in a Bloomberg survey was for a 2.5 percent advance. Greece’s government debt rating was cut yesterday one step to A2 from A1 by Moody’s Investors Service, less than some strategists expected. Moody’s kept a negative outlook on the rating. Gains in the dollar were limited as the euro-dollar’s 14- day relative strength index, or RSI, has remained below 30 since Dec. 17, a sign that the dollar is likely to fall after rising too fast. The index was at 25.43 today. Canada’s Finance Minister Jim Flaherty said China, with the world’s largest currency reserves of $2.3 trillion, may purchase Canadian dollars as it tries to shield its reserves against the U.S. dollar’s depreciation. New Zealand’s dollar dropped as the nation’s economy grew 0.2 percent in the third quarter, compared with the 0.4 percent forecast by economists in a Bloomberg survey. “The lower than expected GDP number has weakened the currency,” said Alex Sinton, a senior dealer at ANZ National Bank Ltd. in Auckland. “We’re looking at 69.03 cents on the kiwi,” he said, using the currency’s nickname. The New Zealand dollar was little changed at 69.95 U.S. cents after dropping to as low as 69.75 cents. It bought 64.20 yen from 64.23. FKLI Dec Futures contract traded marginally 1.5 point lower to close at 1257.5 levels as compare to previous trading session to with a total of 2,256 lots traded in the market. FKLI was traded lower tracking closely on ShangHai Indices despite regional indices were traded strong together with Dow Jones electronic trading. FKLI fail to break above previous high at 1263 levels; hence attempt to test support levels at 1256 regions. Technically, momentum indicator RSI in FKLI hourly price chart shows some strength to trade upwards where support levels at 1256 and 1251.5 must be able to against the selling pressure in the coming trading sessions as RSI in daily price chart has yet to show any buying momentum of FKLI. 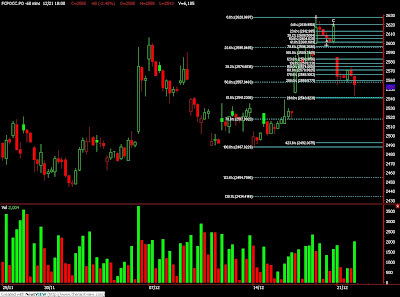 Resistance levels to FKLI trading were seen at 1263 and 1271 regions. CPO 3rd month Mac futures contract plunge RM40 points lower as compare to previous trading sessions to close at RM2515 with a total of 5,916 lots traded in the market. CPO price plunge lower during trading session as soybean oil were traded weak during overnight trading session despite crude oil was closed firm on overnight trading. CPO price plunge below RM2560 region upon open for trading and continue trade lower without significant rebound activity. 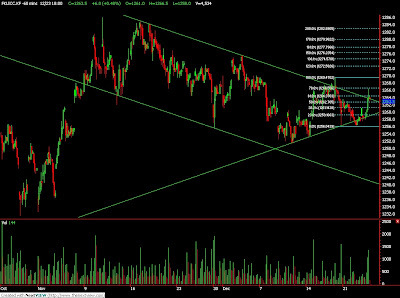 Technically, CPO price seems manage to rest above 78.6% Fibonacci support level at RM2517 regions which directly same levels with upwards support trend line in the hourly and daily price chart. 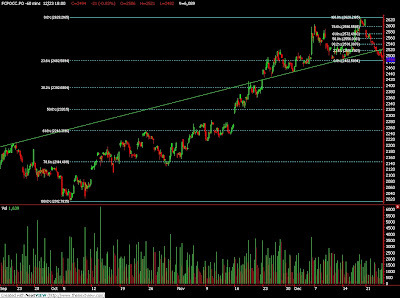 Support levels at RM2517 and RM2490 view vital for bull trend to remain intact in the medium term. 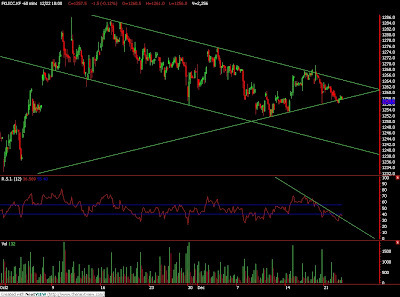 Resistances levels were seen at RM2560 and RM2600. “The price is very comfortable,” el-Badri said. He is “not happy” with members’ adherence with oil production targets, adding that overall compliance is about 60 percent. OPEC sets output levels for 11 of its members in an effort to guide prices. Iraq is exempt from quotas. Algerian Oil Minister Chakib Khelil said he would “like to see 100 percent compliance” with the output targets. Prices are “OK,” Khelil said, and he expects prices to stay around the same level next year. Officials from countries including Kuwait and Libya have already signaled no need to change quotas in comments this month. All 36 analysts in a survey by Bloomberg last week said they expected OPEC to maintain its formal production limit at the Angola meeting tomorrow. Qatari Minister Abdulla bin Hamad al-Attiyah reiterated today that current output quotas are likely to be maintained at the meeting. He made the same comment in Kuwait City a week ago. OPEC, supplying about 40 percent of the world’s oil, is meeting in the Angolan capital Luanda amid expectations that crude demand will rebound in 2010 after a two-year slump as the global economy mends. The International Energy Agency on Dec. 11 raised its forecast for oil demand next year, highlighting growth in Asia and the Middle East and Asia. Demand from China is currently strong, the Qatari minister said today. Crude oil for January delivery fell 89 cents, or 1.2 percent, to settle at $72.47 a barrel on the New York Mercantile exchange. The January contract expired today. Brent crude for February settlement declined $1.14 to $72.61 a barrel at 4:57 p.m. New York time on the London-based ICE Futures Europe exchange. The oil price is “very comfortable” for OPEC producers, the group’s president and Angolan oil minister, Jose Maria Botelho de Vasconcelos said in an interview in Luanda today. The economic slump has curbed demand for oil, leading to a build-up of stockpiles in North America and Europe. IEA statistics show inventories in North America and Europe are still “well above” their five-year average. OPEC should work to bring inventory levels down to a “reasonable level” of 52 days worth of supply, compared with about 59 days currently, el-Badri said today. “We don’t expect any change in the level of production,” Oil and Energy Minister Rafael Ramirez said in Caracas. Venezuela’s position is to maintain production and wait for the March 2010 meeting, he said. The group doesn’t need to meet again before its next scheduled March 17 conference if market conditions stay the same, el-Badri said. OPEC’s members are Algeria, Angola, Ecuador, Iran, Iraq, Kuwait, Libya, Nigeria, Qatar, Saudi Arabia, the United Arab Emirates and Venezuela. Dec. 22 (Bloomberg) -- Crude oil was little changed in New York after declining amid a stronger dollar, reducing demand for commodities as an alternative investment. Oil fell 1.2 percent yesterday after the U.S. currency rebounded. Futures had risen earlier as Nigeria’s main militant group claimed its first assault on oil infrastructure in the country in five months, and Iraq shut an export pipeline to Turkey after an explosion. Iranian troops withdrew from a disputed Iraqi oil well on Dec. 19, Iraqi officials said. Crude oil for February delivery traded at $73.67, down 5 cents, in electronic trading on the New York Mercantile Exchange at 8:48 a.m. Singapore time. January futures, which expired at the close of floor trading yesterday, had dropped 89 cents to $72.47 a barrel. Prices are up about 65 percent this year. The U.S. currency changed hands at $1.4275 per euro in early trading after appreciating 0.4 percent yesterday. The dollar may gain further on speculation the Federal Reserve is preparing to withdraw the stimulus it offered. “Traders are balancing the worrisome headlines from Nigeria and Iraq against the ample stockpiles and spare capacity that is on hand,” said Phil Flynn, vice president of research at PFGBest in Chicago. The Movement for the Emancipation of the Niger Delta, or MEND, said Dec. 19 it attacked a pipeline in the southern oil region used by Royal Dutch Shell Plc and Chevron Corp. The “warning strike” at Abonemma in Nigeria’s southern oil region was to protest the lack of progress in talks with the government since President Umaru Yar’Adua was hospitalized in November, Jomo Gbomo, a spokesman for MEND, said in an e-mailed statement over the weekend. Nigeria’s oil minister said Shell will need government approval to sell oilfields following a report that it plans to sell as much as $5 billion of assets in the nation. In Iraq, the pipeline supplying the Ceyhan oil export terminal was sabotaged around 8:30 p.m. local time Dec. 19, Asim Jihad, an Oil Ministry spokesman, said over the weekend. The Iranian forces left the al-Fakah well late Dec. 19, Iraq’s deputy minister of oil, Abdul Kareem al-Luaibi, told reporters in Baghdad over the weekend. Some traders are taking off during the last two weeks of the year because of winter holidays. There will be no trading on Dec. 25 for Christmas and on Jan. 1 for New Year’s Day. The Organization of Petroleum Exporting Countries has a consensus on “no change” in oil production quotas for the group’s meeting, Secretary-General Abdalla el-Badri said. “At the moment we are comfortable with prices,” OPEC President and Angolan Oil Minister Jose Maria Botelho de Vasconcelos said in an interview with state radio. “Everything indicates that we will maintain the present situation,” when OPEC ministers meet. Members from countries including Kuwait and Libya have already signaled no need to change quotas in comments this month. All 36 analysts in a survey by Bloomberg last week said they expected OPEC to maintain its formal production limit at the Angola meeting tomorrow. Brent crude oil for February settlement declined 76 cents, or 1 percent, to end the session at $72.99 a barrel on the London-based ICE Futures Europe exchange yesterday. Dec. 22 (Bloomberg) -- The dollar may extend gains against its major counterparts on speculation the Federal Reserve will withdraw stimulus measures earlier than expected amid signs the U.S. economic recovery is gaining momentum. The U.S. currency was at $1.4285 per euro at 8:57 a.m. in Tokyo from $1.4275 in New York yesterday. The dollar was at 91.06 yen from 91.17 yen yesterday when it touched 91.23 yen, the highest level since Nov. 4. The yen was at 130.09 per euro from 130.18. U.S. personal spending probably rose 0.7 percent in November for a second month, according to the median estimate of economists in a Bloomberg survey before the Commerce Department report due tomorrow. Combined sales of new and existing homes last month may have reached the highest level since May 2007, other figures may show. The Dollar Index, which IntercontinentalExchange Inc. uses to track the greenback against currencies including the euro, yen, pound and franc, gained 0.4 percent to 78.116 yesterday, near its three-month high of 78.141 set on Dec. 18. Futures trading in Chicago indicated a 46 percent chance that the Fed will increase its target rate for overnight lending between banks, currently between zero and 0.25 percent, by at least a quarter-percentage point by the June meeting, up from a 32 percent likelihood a month ago. The Fed has begun using Treasuries and agency debt in reverse repurchase agreements this month to test a mechanism for unwinding unprecedented monetary stimulus, removing a total of $990 million in cash from the banking system in five operations since Dec. 3. Before a Dec. 4 payrolls report showed an unexpected drop in the U.S. unemployment rate, the gauge of the greenback had fallen 17 percent from its 2009 peak reached in March as evidence of a global economic rebound spurred investors to buy higher-yielding assets funded with dollars. Adding to the dollar’s momentum, a gap of yields on U.S. debt over Japanese bonds reached the widest in more than one year amid signs of rising inflation expectations in the U.S. The spread between 10-year Treasury yields and the same maturity Japanese government bonds reached 244.5 basis points yesterday, the biggest since Oct. 31, 2008. “Widening yield gaps are now favoring the dollar,” said Minoru Shioiri, chief manager of foreign-exchange trading at Mitsubishi UFJ Securities Co. in Tokyo. The Swiss franc may extend its advance for a fifth-straight day against the euro amid growing speculation the Swiss National Bank has relaxed its resistance to gains in the currency. The franc touched 1.4850 yesterday, the strongest level since March 12, when the central bank bought foreign currency to weaken the franc and support the economic recovery. “It now seems to be appropriate to assume that central banks which seek to withdraw stimulus measures also need to accept the appreciation of their own currency,” Koichi Kurose, chief strategist in Tokyo at Resona Bank Ltd. The Swiss National Bank began intervening in foreign- exchange markets in March to prevent gains that hampered exports and increased the risks of deflation. The Swiss currency was at 1.4934 per euro from 1.4938 yesterday when it hit 1.4850, the strongest since March 12. CPO 3rd month Mac futures contract plunge RM65 points lower as compare to previous trading sessions to close at RM2555 with a total of 6,105 lots traded in the market. CPO price plunge lower as soybean oil was trade weak during long holiday period while electronic trading didn’t show interest of recovery after heavy sell down. CPO price plunge below RM2600 since open for trading but manage to rebound 61.8% Fibonacci resistance levels of intraday range at RM2573 regions. Technically, CPO price seems possible to complete wave C where objective price at RM2541 regions; 61.8% Fibonacci and 261.8% Fibonacci support levels. CPO price would remain intact with bull trend provided support levels at RM2540 and RM2488 were not violated during trading sessions. However, resistance levels were expected at RM2596 and RM2620; mark of previous high and low of the recently sell down. FKLI Dec Futures contract traded marginally 1 point lower to close at 1259 levels as compare to previous trading session to with a total of 2,374 lots traded in the market. FKLI was traded lower despite regional indices were traded mix while Dow Jones futures electronic was traded without firm direction. FKLI break lower after long consolidate within range from 1264 to 1260 regions but sell activity seems on hold above 78.6% Fibonacci support levels at 1275.5 regions. 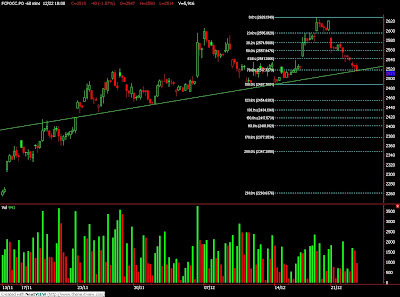 Technically, FKLI is very close to the decisive moment where critical supports were seen at 1257.5 and 1251.5 levels. Support levels are seen crucial in order to bull trend to remain intact. On the other hand, resistance levels were seen at 1270 and 1281.5 levels that were expect to have great selling pressure. Dec. 21 (Bloomberg) -- Crude oil traded above $73 a barrel in New York after rising last week amid optimism that global demand will increase as the world economy recovers from its worst recession since World War II. Oil prices may rise this week on expectations that increasing U.S. fuel demand will reduce inventories, according to a Bloomberg News survey. Reports this week are forecast to show increasing sales of existing homes and new homes in the U.S.
Crude oil for January delivery was at $73.53 a barrel, up 17 cents, in after-hours electronic trading on the New York Mercantile Exchange at 8:59 a.m. Singapore time. It fell as low as $72.95 a barrel. The contract, which expires today, rose 1 percent to $73.36 on Dec. 18, the highest settlement since Dec. 7. Futures climbed 5 percent last week, the most in two months, and are up about 65 percent this year. Prices had jumped as much as 2 percent after Iranian troops occupied an oil field in southern Iraq. Crude declined after Iranian troops left a disputed region of its border with Iraq. Iranian troops withdrew from the al-Fakah well in the East Maysan field late Dec. 19, Iraq’s deputy minister of oil Abdul Kareem al-Luaibi told reporters in Baghdad yesterday. The issue was resolved diplomatically, he said. Oil for February delivery, the more actively traded contract, climbed as much as 45 cents, or 0.6 percent, to $74.87 a barrel. It rose 0.5 percent on Dec. 18. OPEC won’t reconsider or review oil quotas at this week’s meeting of the Organization of Petroleum Exporting Countries in Luanda, Angola, Iraq’s Oil Minister Hussain al-Shahristani said. Iraq is calling for stricter compliance with OPEC quotas, al-Shahristani said in an interview yesterday. Brent crude oil for February settlement rose as much as 57 cents, or 0.8 percent, to $74.32 a barrel on the London-based ICE Futures Europe exchange. It gained 0.5 percent to $73.75 on Dec. 18. Hedge-fund managers and other large speculators reduced their bets on rising oil prices to a two-month low, according to U.S. Commodity Futures Trading Commission data. Speculative net-long positions, the difference between orders to buy and sell the commodity, fell 22 percent to 53,192 contracts on the New York exchange in the week ended Dec. 15, the commission said in its weekly report. Dec. 21 (Bloomberg) -- The dollar traded near a three-month high against the euro as signs that the world’s largest economy is gaining traction and lingering credit concerns in Europe buoyed demand for the greenback. The U.S. currency may extend its biggest weekly rally since June against its major counterparts before reports this week forecast to show increasing sales of existing homes and new homes in the U.S. The 16-nation euro dropped for a fourth day against the Swiss franc after the European Central Bank raised its estimate for writedowns in nations using the single currency by 13 percent. The dollar traded at $1.4324 per euro as of 8:47 a.m. in Tokyo from $1.4338 in New York on Dec. 18 when it hit 1.4262, the strongest level since Sept. 4. The yen was at 129.56 per euro from 129.75 last week. The U.S. currency was at 90.45 yen from 90.49 yen in New York. The euro fell to 1.4901 Swiss francs from 1.4950 last week. The National Association of Realtors will report Dec. 22 that purchases of existing homes rose 2.5 percent in November to an annual pace of 6.25 million, the highest level since February 2007, according to a Bloomberg News survey of economists. The Commerce Department on Dec. 23 will report sales of new homes rose 1.9 percent to a 438,000 annual pace last month, the fastest since August 2008, according to a separate survey. Futures traders increased their bets that the euro will decline against the U.S. dollar, figures from the Washington- based Commodity Futures Trading Commission show. The difference in the number of wagers by hedge funds and other large speculators on a decline in the euro compared with those on a gain -- so-called net shorts -- was 16,448 on Dec. 15, compared with net shorts of 511 a week earlier. The Dollar Index, which the ICE futures exchange uses to track the greenback against the euro, yen, pound, franc, Canadian dollar and Swedish krona, rose 1.6 percent to 77.821 last week, the biggest rally since the five days ended June 5. The index touched 78.141 on Dec. 18, the highest level since Sept. 4. The gauge of the dollar has appreciated 4 percent from this year’s weakest level reached on Nov. 26 as government figures showed the U.S. unemployment rate fell last month to 10 percent and retail sales rose more than forecast. Before a U.S. payrolls report on Dec. 4, the greenback had fallen 20 percent from the 2009 peak reached in March as evidence of a global economic rebound spurred investors to buy higher-yielding assets funded with dollars. The euro weakened versus the dollar last week as the European Central Bank said lenders may have to write down an additional 187 billion euros ($268 billion) as loans to property companies and eastern European nations threaten the financial recovery. Greece’s credit rating was cut by Standard & Poor’s, and the company said it may take further action unless Prime Minister George Papandreou tackles the European Union’s largest budget deficit. Greek Finance Minister George Papaconstantinou said he doesn’t rule out Moody’s Investors Service cutting the country’s credit rating, El Pais reported. The euro dropped last week against the Switzerland currency as the Swiss National Bank refrained from selling the currency, pushing it beyond 1.50 for the first time since a rally in March that led to an intervention. The central bank changed its language on currency purchases this month, saying it will act to counter “any excessive” moves in the franc against the euro. At its September assessment, the bank said it would “continue to act decisively” to prevent “any” appreciation. The franc tumbled 3.3 percent against the euro on March 12, the largest drop since the common currency debuted in 1999, when the Swiss National Bank intervened to prevent a strengthening currency from undermining the economy. trading sessions for FKLI as FKLI search high and low during trading session along with regional indices and Dow Jones electronic trading. FKLI traded lower after fail to hold above short term support levels at 1262 region during trading session. Technically FKLI would remain to seems bullish provided 78.6% Fibonacci support levels at 1256 were not violated during trading sessions else, further selling pressure would test next support levels at 1251.5 regions. FKLI must test and penetrate resistance levels at 1267 and 1281.5 in the coming trading sessions in order for weekly MACD to show strength on upside. resistance level at RM2619 and RM2628 region which directly cause CPO price into consolidation phase. Technically, CPO price still seen bullish provided that critical support level at RM2488 and RM2541; 61.8% Fibonacci support level, were not violated during trading session. However, CPO price would seen continue to surge provided resistance levels at RM2622; Indicator Stop And Reverse, and RM2640; 61.8% Fibonacci resistance levels were penetrated.